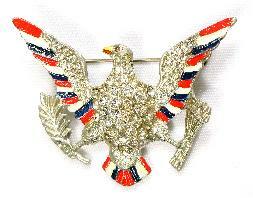 Vintage pin collection featuring a selection of eagle pins and brooches. 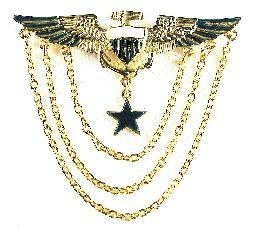 These designs were very popular during World War II, with many being based on the Great Seal of the United States. Most include laurel leaves and olive branches representing peacetime and arrows denoting wartime. A left-facing eagle, typically looking towards the leaves or branches, is the most popular orientation of the design. This collection is displayed for research and information purposes only. 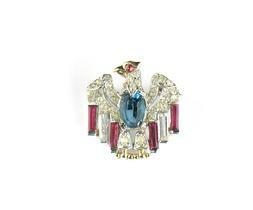 CORO RHINESTONE AND ENAMELED EAGLE PIN Circa late 30s to early 40s, this pot metal, cold enameled eagle pin features a crystal rhinestone body and wings, red/white/blue feathers, yellow beak and a red rhinestone eye. Holding an olive branch and arrows in its talons, this magnificent eagle measures 2 3/8" X 2" and is signed "Coro" in script without a copyright symbol. RED, WHITE AND BLUE ENAMELED EAGLE PIN Beautiful and unusual eagle pin with enameled red beak, black talons, red/white/blue wings, red rhinestone eye and pave crystal rhinestone body. 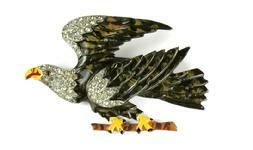 This sterling vermeil 40s eagle measures 3 7/8" X 1 3/8". LITTLE NEMO RHINESTONE AND ENAMEL EAGLE PIN Exceptional pot metal eagle pin with wonderful detail and unusual design, signed "L/N". 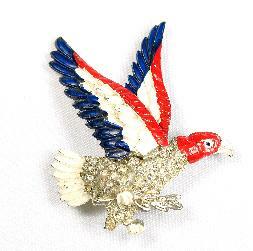 Excellent 3-D construction with riveted, enameled red, white and blue wings, white tail feathers, red head and white beak with a pave crystal rhinestone body. With very light wear to the enameled wings and measuring 2 1/2" X 2 1/4", this early 40s brooch is in excellent vintage condition. PAVE RHINESTONE EAGLE WITH ARROWS AND OLIVE BRANCH Brooch Stunning silvertone eagle pin with large pave rhinestone wings and tail feathers, pave rhinestone olive branch and red, white and blue enameled arrows. 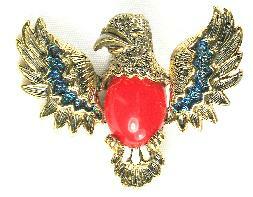 Featuring a red rhinestone eye and wonderful detail, this 3" X 1 3/4" eagle brooch is is excellent condition. 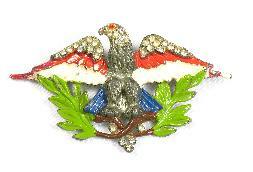 ART ENAMELED EAGLE BROOCH Goldtone brooch featuring red, white and blue enameled wings, white enameled body, yellow enameled beak and talons and a red enameled eye. This very substantial 3 3/4" X 2" sterling vermeil, 1940s pin has been found in the identical casting signed "ART", the mark of the Mode-Art Co. and is being attributed to that company's manufacture. ENAMELED WITH RHINESTONES EAGLE WITH BRANCHES PIN Beautiful pot metal eagle brooch with proud pave crystal rhinestone head, pave crystal rhinestone with red and white enamel wings, red rhinestone eye, grey enameled body and talons, blue enameled tail feathers, and brown and green enameled olive branches. The detail of this piece is magnificent. 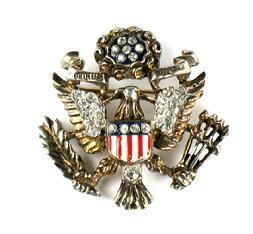 Circa late 1930s, this 3" X 1 3/4" brooch is in excellent vintage condition. 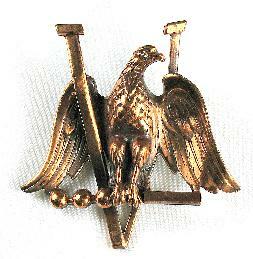 WORLD WAR II VICTORY EAGLE BROOCH This cast-metal pin is finished with copper-colored plating and measures 2 7/8" x 2 7/8". A definite war-time, right-facing eagle, this brooch features a "V" for victory and the eagle is perched on a dot-dot-dot-dash (Morse Code for "V"). It might also denote the "da da da DUM!" that was played at the start of war-time radio broadcasts. Beautiful detail and heavy construction, and in excellent condition. 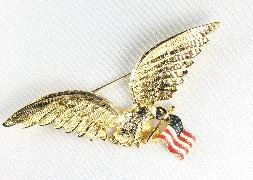 ARTICULATED GOLDTONE EAGLE PIN This wonderful 2 1/4" x 3 1/2" goldtone eagle has articulated wings and tail feathers that move when the pin is worn. An unusual "front-facing" design, featuring wonderful detail and a hook in addition to the brooch pinback to allow wear as a pendant necklace. 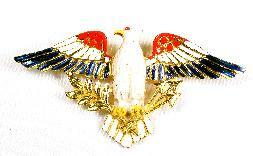 GERRYS EAGLE PIN Goldtone stylized eagle with blue enameled wings, white enameled tail feathers and a red cabochon body. Signed "GERRYS" and measuring 1 1/2" x 1 7/8", this adorable pin is in excellent condition. 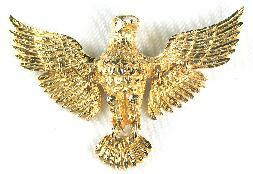 ACCESSOCRAFT EAGLE PIN Accessocraft Eagle Pin This 1 5/8" x 2 1/2" goldtone eagle pin is signed "Accessocraft N.Y.C." in a cartouche. Very interesting that he is a right-facing "war-time" eagle with arrows and no olive branches, but is of obviously later manufacture. 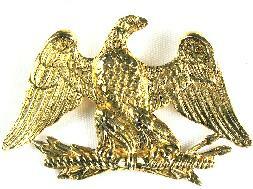 It is possible that this pin was made during the Vietnam War era. 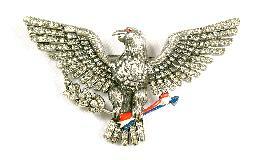 EAGLE ON ATTACK BROOCH There's a wonderful feel of motion to this silvertone, rhodium-plated eagle pin. 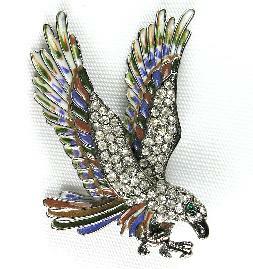 Accented with aurora borealis crystal rhinestones on the head and wing-tips, this 2 1/4" x 2" eagle is in flight, talons extended and ready to pounce on his prey. 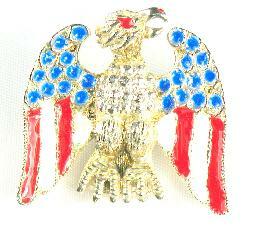 EISENBERG ICE EAGLE PIN Goldtone eagle pin with red, white and blue enameled wings and a pave crystal rhinestone body. Measuring 3 1/4" x 1 5/8" and signed "EISENBERG ICE", this brooch features beautiful detail and is in excellent condition. Please note that this is not a vintage piece, but is of recent manufacture. 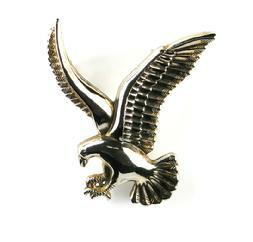 CRAFT ENAMELED EAGLE PIN This goldtone pin features an anchor, shield and wing motifs to form a stylized eagle. With blue and white enameled elements, the design includes three chains draped and joined at each wing and a single blue star. The blue star is a popular symbol that is displayed or worn to honor a family member who is serving in the United States military. Measuring 2 5/8 x 2 3/8" and signed "CRAFT", this pin was manufactured by Gem-Craft, the company formed by Gene Verrechia (Coro's head designer for many years) and his son, Ron. ART PASTEL ENAMELED EAGLE PIN A very unusual design with lime green, bright orange, rose-pink and aqua blue enamel, this lovely brooch measures 3 5/8" x 1 7/8" and is signed "ART". 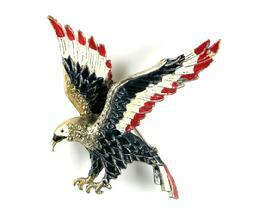 GOLDTONE EAGLE IN FLIGHT WITH FLAG Stunning goldtone eagle with outstretched wings carries an enameled American Flag. Well-made brooch measuring a substantial 3 1/4" x 1 1/2". TRIFARI STERLING SILVER AND RHINESTONE EAGLE PIN Majestic sterling silver vermeil eagle with outstretched wings features detailed features, pave crystal chaton rhinestone topped wings, body and legs, and a red rhinestone eye. Measuring 2 3/4" x 1" and signed "TRIFARI" topped by the crown trademark and "STERLING". Circa 1940s. CORO STERLINGCRAFT EAGLE PIN Unique sterling silver eagle pin with a puffy heart dangle measures 1 1/2" x 3/4". 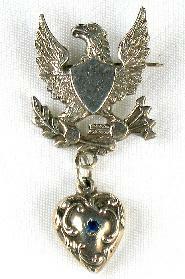 A circa mid-1940s design featuring a shield, arrows and olive branch and a sapphire-blue rhinestone accent on the puffy heart dangle, it is signed "STERLINGCRAFT BY Coro". GOLDTONE TEXTRURED WITH CRYSTAL RHINESTONE EAGLE PIN With heavy gold-plating and a detailed textured design, this right-facing eagle pin features a row of pave crystal chaton rhinestones atop each outstretched wing and a crystal rhinestone eye. Measuring 2 5/8"
TRIFARI 1940's PAVE CRYSTAL, RUBY and SAPPHIRE COLORED RHINESTONES EAGLE PIN Silver-tone rhodium-plated eagle pin is a miniature work of art, with gold-tone highlights at the head and talons, pave crystal rhinestone body, ruby-red cabochon eye and alternating ruby-red and crystal rhinestone baguette features. Measuring 3/4" x 3/4" and designer signed "TRIFARI" without a copyright symbol. The design patent for this piece is number 122220 issued to Trifari - Alfred Philippe on August 27, 1940. BEST SIGNED MAJESTIC EAGLE ON ATTACK BROOCH Silver brooch is constructed with a stamped metal eagle in attack position with raised wings and outstretched talons; the back is separated welded to the piece and is smooth. Measuring 2 3/4" x 2" and designer signed "Best" in script lettering. 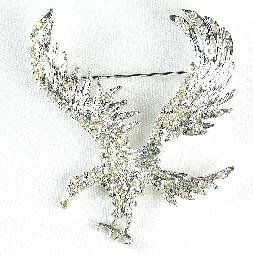 ENAMEL PAVE CRYSTAL RHINESTONE EAGLE ON BRANCH 1930's BROOCH Large silver-tone pot metal brooch is in the shape of an eagle with outstretched wings perched on a branch. The feathers are enameled in two shades of brown and touches of black, yellow-gold and red enamels are appear at the beak and talons. 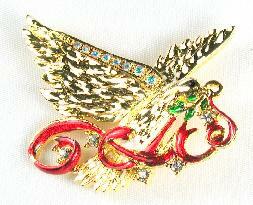 The head and tops of the wings are highlighted with pave crystal rhinestone chatons. Measuring 3" x 2". 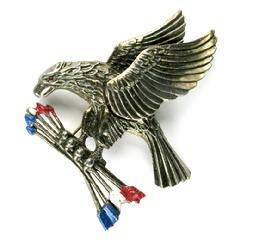 RED WHITE AND BLUE ENAMEL EAGLE LARGE BROOCH Silver-tone pot (white) metal with gold-tone highlights huge eagle brooch with outstretched wings and feather detail is enameled in red, white and blue. Measuring 3 1/2" x 2 5/8". TRIFARI STERLING ENAMEL GREAT SEAL EAGLE PIN Sterling silver pin in the shape of the Great Seal of the United States of America features an eagle clutching an olive branch and arrows in his talons with pave crystal rhinestone topped wings and a shield of red, white and blue enamel. Ribbons with E Pluribus Unum and the blue enameled, thirteen-starred (rhinestones) New Constellation appear at the top of the design. Measuring a petite 1 1/8" x 1 1/4", and designer signed Trifari with the trademark crown logo over the "T". Also marked STERLING. MAJESTIC EAGLE WITH RED, WHITE AND BLUE ARROWS BROOCH Gold-tone large eagle brooch is designed with open raised wings and talons clutching arrows tipped in red, white and blue enamels and a ruby-red rhinestone eye. The forward wing is riveted to the body, and has slight articulation (movement). Measuring 2 1/2" x 2 1/2" and constructed of plated pot or white metal. The patent for this design is number 21913 issued to Louis C. Mark on August 13, 1940, assigned to Rice-Weiner & Co. In "American Costume Jewelry, Art & Industry, 1930 - 1950, Volume 2", Roberto Brunialti mentions "The item was described by WWD, 21st June 1940, where it specified that it came either in white metal or gold-plated metal." This early 1940's design is a fascinating representation of the times, with the fierce eagle clutching arrows denoting a war-time theme. CORO EAGLE WITH FLAG PINS Two Coro "eagle with flag" pins, 1 X 1 1/2" in size, with identical features. The one on the right is missing the red rhinestone eye and two crystal rhinestones. For the back view of the two pins. The one on the left has heavy plating while the one on the right is an "indented" casting of much lighter weight. Also, notice the difference in the length of the "pins;" the one on the right can be assumed to be an earlier version because the pin sticks out about 1/8" beyond the clasp. Mark on the first pin is "STERLING" AND "Coro" in script. Mark on the second pin is "STERLING BY Coro." I have never seen this exact mark on any other Coro item.